Accompanying the awesome project name was fantastic work by the students who chose to participate. All students involved in RadioZilla were concurrently taking, or had previously taken, the Facing History elective course in Ontario, Genocide and Crimes Against Humanity. 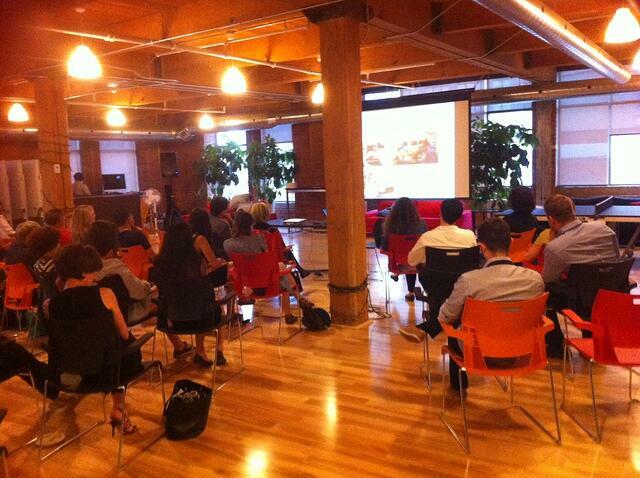 The attentive crowd at the RadioZilla wrap party at Mozilla's office in downtown Toronto. At the wrap party on a stormy evening in Toronto two weeks ago, we listened to all of the pieces the students created, and engaged in conversation with them about their process and learning. Many fantastic comments were made and ideas shared, but one of the students said something that really stuck with me. She said that she had always felt voiceless until her teacher, the Genocide course, and this project combined to give her the skills, confidence, and opportunity that she needed to start making her voice heard. Here is a sneak peak at one of the radio pieces along with a couple connections questions. This project helped these students choose to participate - maybe it can help you and your students think of ways to participate as well! 1) What can be done to motivate people from inaction to action? 2) What is the role of community in creating change? What constitutes community? 3) In what ways can you choose to participate in bettering your community?